A Soyuz-2.1b rocket successfully sent the newest GLONASS-M into orbit on Friday, September 22, in order to replenish the Russian Global Navigation Satellite System (GLONASS). The launch took place at 0:03 UTC (8:03 p.m. EDT on September 21) from Site 43/4 from the Plesetsk Cosmodrome in northern Russia. The start of the mission was initially scheduled for September 6; however, it was postponed for two weeks in July. The launch campaign commenced in late August when the GLONASS-M № 52 spacecraft was delivered to Plesetsk. After the arrival at the Cosmodrome, the satellite passed initial tests and checkouts, what started a busy four weeks of preparations for the launch. This phase culminated in the encapsulation of the spacecraft in the payload fairing and its installation on the Soyuz-2.1b rocket. The launch vehicle was then rolled out to the pad and awaited the upcoming countdown for the liftoff. The eight-hour countdown campaign enabled engineers to conduct final checkouts before the propellant loading sequence was initiated some four hours before the launch. Finally, the six-minute automated countdown sequence was started, which led to the ignition of the rocket’s four boosters. Powered by its RD-107A engines, the Soyuz-2.1b rocket started its short vertical climb. The four boosters were responsible for accelerating the launch vehicle to a velocity of about 1.5 km/s during the initial phase of the flight. They were then jettisoned at approximately two minutes into the flight. GLONASS-M № 52 satellite. Photo Credit: ISS Reshetnev. The launch vehicle continued the ascent being powered by its core stage until it was detached at about four-and-a-half minutes after launch. Afterward, the third stage took control over the mission for about four minutes. This phase of the flight ended when the rocket’s Fregat-M upper stage separated from the third stage and commenced its three-hour trek tasked with injecting the satellite into its targeted circular orbit at an altitude of approximately 11,900 miles (19,100 kilometers), inclined 64.8 degrees. “Steady telemetric contact is being maintained, and the satellite’s systems are operating normally,” the Russian Defense Ministry reported after the spacecraft’s deployment into orbit. GLONASS-M satellites, also known as Uragan-M, are the second generation of Uragan satellite designs used as part of the Russian GLONASS radio-based navigation system. A typical GLONASS-M spacecraft, developed by the Reshetnev Information Satellite Systems (ISS Reshetnev) and operated by the Russian Aerospace Defense Forces, is about 7.87 by 12.14 feet (2.4 by 3.7 meters) and has a launch mass of some 1.4 metric tons. According to Roscosmos, Glonass-M № 52 was in the ground reserve of the GLONASS system. ISS Reshetnev built the satellite over two years ago and was responsible for storing it. The satellite’s serviceability was tested before it was sent to the Plesetsk Cosmodrome. GLONASS-M № 52 will replace one of the recently-failed satellites of the network. GLONASS provides real-time position and velocity determination for both military and civilian users. All the satellites are located in a middle circular orbit at about 11,900 miles (19,100 kilometers) altitude with a 64.77-degree inclination at a period of 11 hours and 15 minutes. They provide an accuracy of 328 feet (100 meters) as part of the public segment and 33 to 66 feet (10 to 20 meters) for military purposes. The system operates in three orbital planes, with eight evenly spaced satellites on each. A total of 24 satellites are required to guarantee global coverage, while 18 are necessary to cover the territory of Russia. GLONASS-M satellites have a total power of 1,250 watts and are designed to operate for up to seven years. Equipped with three caesium clocks, they can provide the accurate timing that is required for navigational purposes. Satellites of this type broadcast four FDMA signals in the L1 and L2 frequency bands. The first spacecraft in the series was launched in December 2003, while the final satellite is expected to be sent aloft in late 2018. The Soyuz-2.1b rocket employed for Friday’s launch is an upgraded version of the three-stage Soyuz-2 booster. The 151-foot (46.1-meter) tall launch vehicle has a total mass of 672,000 pounds (304,814 kilograms) and is designed to put satellites into a variety of orbits. For Friday’s mission, the Soyuz-2.1b rocket was used in a configuration with a Fregat-M third stage. This upper stage measures approximately 4.9 feet (1.5 meters) long and is 11 feet (3.35 meters) in diameter. Its S5.92 engine is designed to burn for about 18 minutes. Friday’s launch was the 14th flight for Russia and the third launch from Plesetsk in 2017. 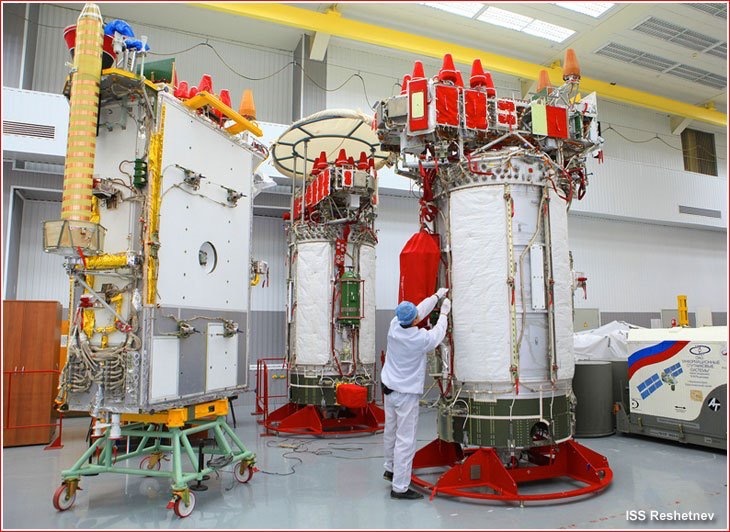 Next mission of a Russian booster is currently scheduled for September 28 when a Proton-M rocket will orbit the AsiaSat 9 communications satellite. The launch will be conducted by International Launch Services (ILS) from the Baikonur Cosmodrome in Kazakhstan.